Since 1962, the Pacific Science Center in Seattle has been providing a fun and educational atmosphere to visitors of all ages. For you and your fiancée, the center will provide an ideal engagement photography location. Kick off your engagement photo shoot inside the center’s courtyard area, which uses water and fountains to create some innovative and beautiful architecture. You and your fiancée can pose for a portrait on one of the docks, using the glimmering flower-shaped fountains as background. Take a seat on courtyard steps and have your engagement photographer snap some relaxed photos of you and your loved one. Your photographer can also utilize the towering iron arches in the courtyard area as a unique backdrop for your engagement photos. Afterward, head over to the center’s Tropical Butterfly House, where you can pose for photos inside a tropical oasis that is filled with colorful fluttering butterflies. Admission to the Pacific Science Center is $14.00 for adults and park hours, which vary, can be found on the website. Once you’ve finished at the Pacific Science Center, take a short drive over to Seattle University, a small campus that contains plenty of scenic locations for your engagement photography session. Have your engagement photographer create an intimate portrait of you and your fiancée beside the sparkling Millennium Fountain or seated on the steps in the very same courtyard. Take a promenade along the campus walkways as your photographer snaps some candid photos. Finally, be sure to pause for photos beneath the blooming pinkish cherry blossom trees that are scattered throughout the campus. Serene and secluded, Seattle’s Kubota Garden is one of the most gorgeous Japanese Gardens in the entire Northwest and a great place to have your engagement photography session. Begin your photo shoot with a portrait of you and your fiancée in front of the garden’s entrance gate. Venture inside and take a leisurely stroll through the garden as your engagement photographer goes to work. Pose for some seated photos on the garden’s stones, overlooking the tranquil pond and surrounded by vibrant flowers. You and you fiancée can also pose on the miniature stone bridge that crosses the water, with the garden’s exotic green bonsai trees in the background. Note that Kubota Garden’s policy requires your photographer to obtain a permit before taking pictures in the garden. Call (206) 684-4080 for permit and fee information. Only a few miles away from Kubota Garden you’ll find Seward Park, a small, peninsular park that extends out into Lake Washington. Once you arrive, you and your fiancée can meander along the park’s woody pathways either toward the thick tree-laden area or toward the water front. Have your engagement photographer take some beautiful engagement portraits of you and your loved one beside a majestic redwood. You and your fiancée can also pose for an intimate portrait out on the dock that stretches out into the water. Feel free to relax and enjoy your natural surroundings on one of the park’s benches as your photographer takes some snapshots. 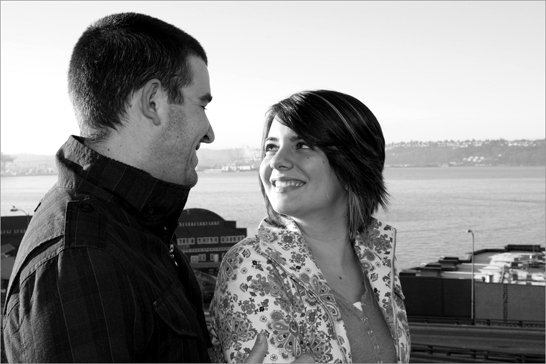 You’ll have a great time during your outdoor photography session in Seattle! For a fascinating excursion into the heart of one of Seattle’s oldest neighborhoods, visit Pioneer Square, located in the southwestern corner of Downtown Seattle. Have your engagement photographer arrange a romantic portrait of you and your fiancée beneath the recently renovated chapel-like Pergola. You and your loved one can also pose on the bench beside Pioneer Square’s famous totem pole for a unique engagement photo. Afterward, visit the square’s most amazing feature – the indoor Waterfall Park. The park features private tables that you and your fiancée can grab while your engagement photographer takes some great photos, with the exotic waterfall in the background. You and your man can also pose along the rail for a different angle of the water crashing over the jagged rocks. For a one-of-a-kind engagement photography location in Seattle’s Pioneer Square, explore the catacombs beneath the ground floor of Doc Maynard’s saloon, a restored tavern from the 1890’s that was built by the early pioneers. Have your photographer snap some dark, mysterious photos as you wander through the underground maze. Once you’ve finished your excursion through the saloon’s subterranean labyrinths, have your engagement photographer can create a portrait of you and your fiancée beneath the charming arched entrance of the adjacent Pioneer Building, a stunning example of brick Romanesque architecture. 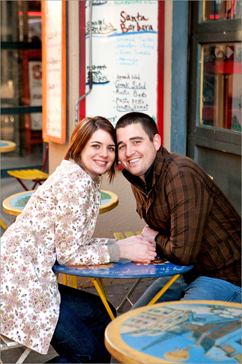 Nearby, you’ll find the Lowman and Hanford buildings, near which you can conclude your engagement photo shoot.